The Clear cartridge review will show you why you probably should avoid this cart brand. We’re here to supply you with the latest information about the best cannabis products on the market to help you make the right choice when purchasing cartridges. With that in mind, we decided to try The Clear Cartridge to see what all the hype is all about. We’ve heard a lot of things about this cartridge brand, some positive and some negative. So we decided it was time to test this brand ourselves to find out if they’re a trustworthy and reliable choice. 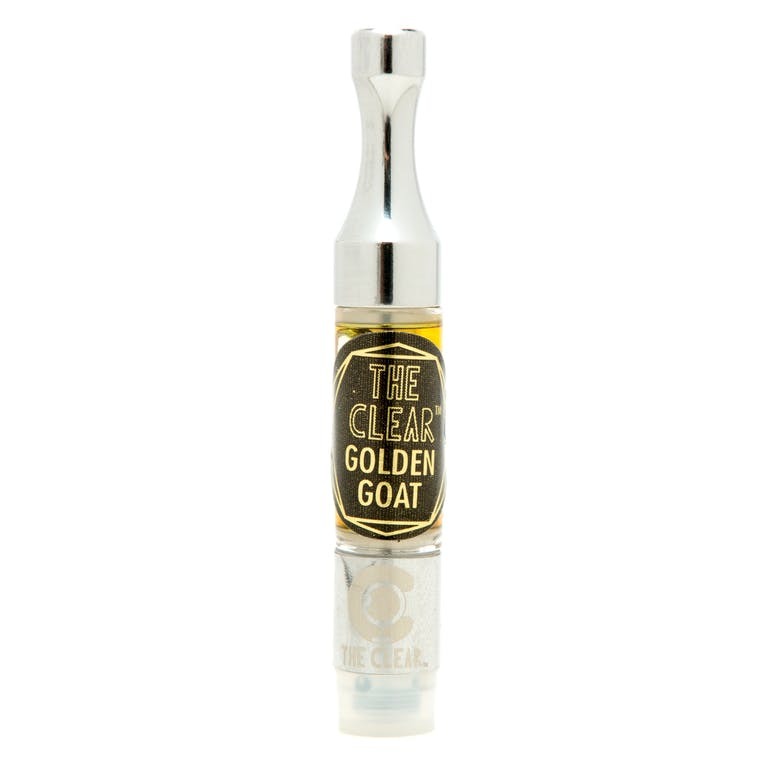 The Clear cartridge made some changes to their previous cannabis oil and vape cartridges. Their older style Classic ones are definitely inferior products. The new Clear cartridges are improved. Unfortunately, they are not sufficient enough to compete with other actual premium vape cartridges. The Clear cartridge reviews on Weedmaps are not that great either. Their current overall rating is a 3.8/5 from among 98 total reviews. I also have seen comments from people who are aware that The Clear’s THC content isn’t accurate. If you visit The Clear cartridge’s website, you’ll find that it’s attractive and visually appealing. Everything appears to be in order and there’s a lot of promising information here, telling potential buyers that the brand works hard to develop a reputable and reliable cannabis brand by using science and innovation. 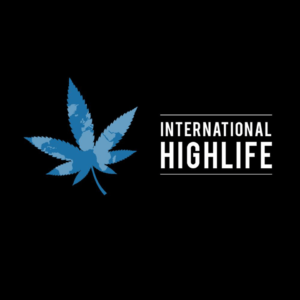 The brand tells the reader that they’re working on developing state of the art cannabis products via refining, improvements, and experimentation so a new standard can be set for premium quality products. The brand has a pretty illustrious history too. The Clear cartridge was first launched in 2012, so they’ve been around for a long time. They started out making classic solvent extractions and in 2013 launched their process of especially which, according to their website, led to their concentrates becoming recognized for their ultra-refined and translucent composition. However, we wanted to know for ourselves whether the reality matched up to the hype. The most recent Clear cartridge reviews on their Weedmaps page are negative with complaints of their carts not working. While testing these cartridges, we’ve found several issues with them when taking hits. Some cartridges produced no smoke and this is a pretty serious problem, mainly since The Clear cartridges aren’t cheap. In some cases, although they tasted good, it took about ten hits before feeling any effects. The Elite cartridges have been designed to be C-Cell type. Meanwhile, the old Classic style ones have wicks. If you’re using Classic cartridges, there’s a significant chance that the wick won’t soak thoroughly. Therefore, you’ll experience a burned and unpleasant flavor, this isn’t very convenient, especially if you need immediate relief from your vape. Also, the Classic cartridges have been mixed with MCT oil. This creates a distinctive flavor. This isn’t an issue with the Elite cartridges. Thanks to the C-Cell design, they have a metal coil and ceramic-based cartridge which covers the center of the basin to distribute the draw more evenly and eliminate the burning taste. First things first – let’s look at the flavor of The Clear cartridges. After all, one of their major selling points is their 16 signature flavors. 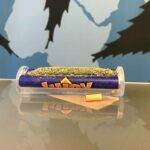 They use only all-natural terpenes and flavors according to their brand website, and each flavor is available in a dabable gram format as well as a disposable cartridge. The website asserts that every flavor of theirs is genuine and authentic to its name. Unfortunately, however, we found that depending on the cartridge, the taste may not live up to expectations. Apparently, The Clear products are made using only organic and kosher flavors and terpenes via a process of steam distillation. The Clear state that their terpenes and flavors only come from natural plants and fruit. 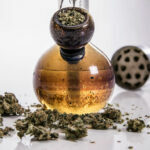 While it’s true that fruit flavors are very much in evidence – we found their pineapple flavor to be particularly powerful – there seemed to be chemical tasting overtones which ruined the taste and made us wonder whether there was any truth in the statement that their flavors and terpenes are all natural. We did, however, try their Super Lemon Haze cartridge and its authentic taste did impress us. This suggests that the quality of the flavor definitely depends on which cartridge you try. What About Contaminants And Pesticides? 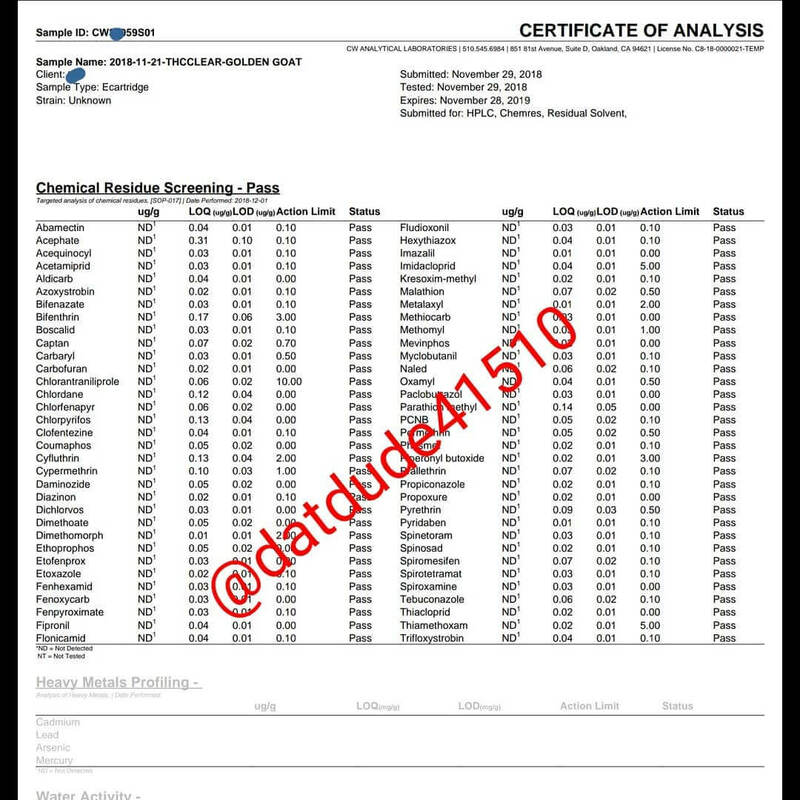 Fortunately, one of the comments on there exposed this company of lying about their THC content amount. 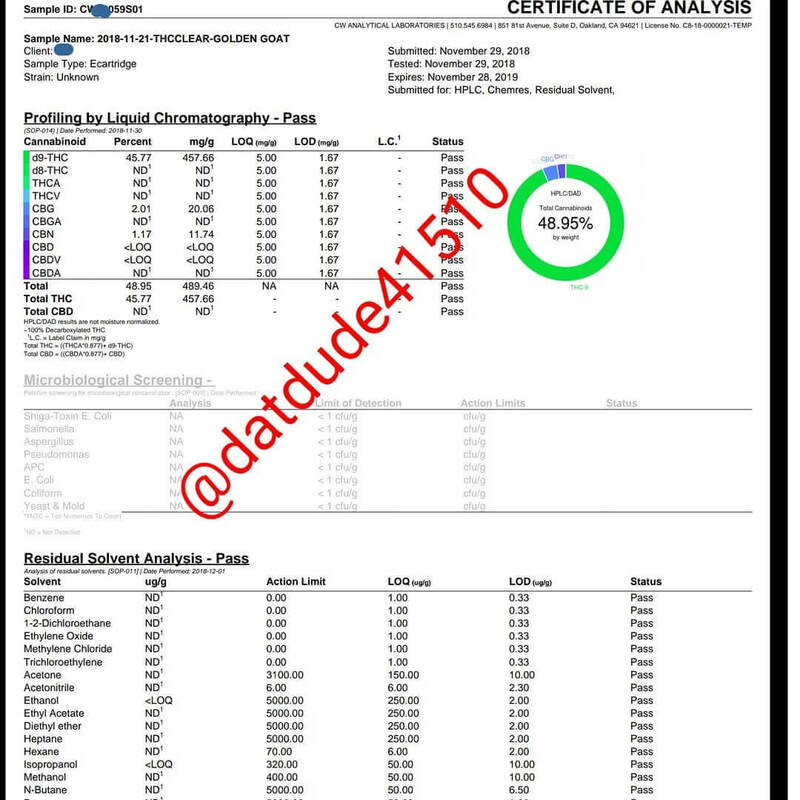 Those who are familiar with datdude41510 on Instagram knows he pays out of his pocket to lab test popular vape cartridges. He then will post the results on his growing Instagram account of 34,000 followers. This guy is located in the bay area and is frequently accepting requests to test prefilled vape cartridges. The typical lab test can average $150-250 for pesticides alone. 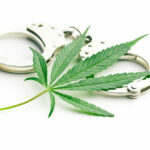 Testing for THC is a lab test done separately from pesticides and can cost $150 on average. If you’re going to vape cannabis cartridges, it’s pretty evident that you don’t want any contaminants or pesticides in them which could cause damage to your health. We’ve all heard of tests where cartridges that were supposed to be free of pesticides and solvents were shown actually to be contaminated and dirty by independent testing bodies. 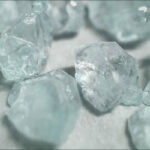 On The Clear’s website, it’s stated that all product batches are quality tested rigorously by some laboratories including SC, Wercshop and Steephill Labs. Indpendent tests did not find any solvents, mold or pesticides in any of the cartridges. Fantastic news for vapers, since you can use these cartridges with complete peace of mind that no unwanted pesticides, solvents or contaminants will be entering your lungs. 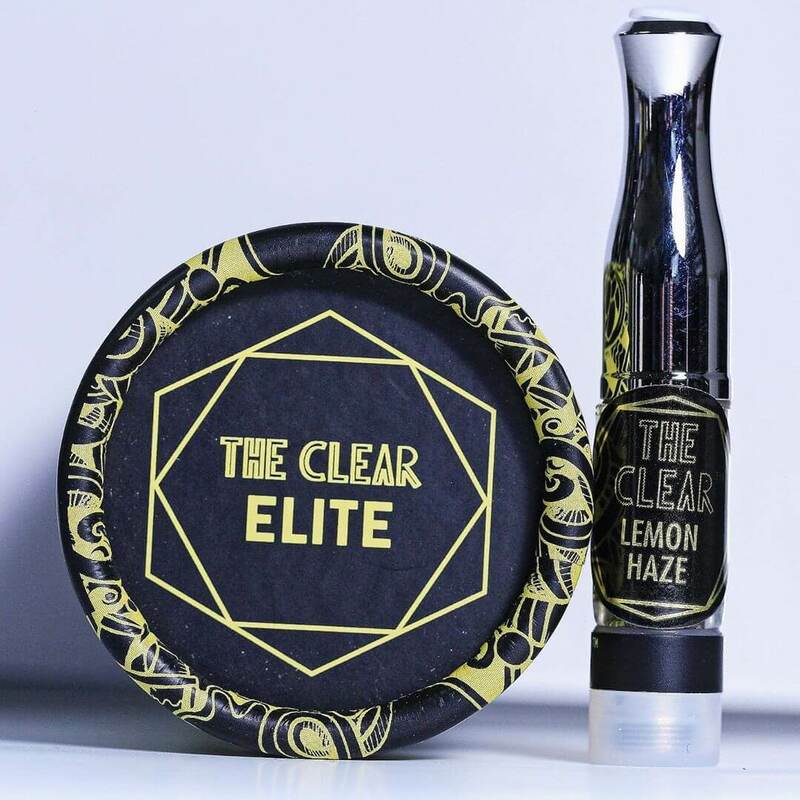 The Clear’s website states their Classic vape cartridges contain at least 65% THC, and their newer Elite cartridges will have at least 80% THC content. Sadly, recent independent tests have shown that some of their cartridges don’t have content as high as this, and in fact, their THC content could be as little as just 50% – well below what they claim. Lab test done independently reveals THC content is much lower than advertised. A key element when selecting the right cannabis vape cartridge for you is how much THC it contains. Therefore, we made this a significant part of the testing process. The Clear has responded to these independent test results by stating that there are lots of counterfeit cartridges out there which buyers are using mistakenly thinking that they are genuine ones. These fakes have lower levels of THC than genuine cartridges. However, should this be the case, it isn’t possible to determine which products are counterfeit and which are genuine, and therefore it’s impossible to know which you’re using. How Much Do The Clear Cartridges Cost? A serious negative point when it comes to buying cartridges from The Clear brand is their high price. Their official retail price is $50 for a gram. There are some dispensaries out there which sell them at a much higher rate, often up to $80 for a gram. This is an extremely high price, especially if you take into account the independent testing of these cartridges, which have revealed lower THC contents than those advertised by the brand’s website. What did we determine from The Clear cartridge review? There are positives and negatives which you should consider if you’re deciding if you want to try out this brand. I recommend checking out our list of the best 10 vape cartridges for 2018. First – the positives. We found some cartridges to have a good flavor. If you love fruit flavors, these cartridges could be ideal. The Clear currently offers 16 options to pick from. With so many options, you’re sure to find one you like. Also, during independent testing of these cartridges, no solvents, mold, pesticides or other contaminants were found. That means you’re entirely safe when you vape these cartridges. 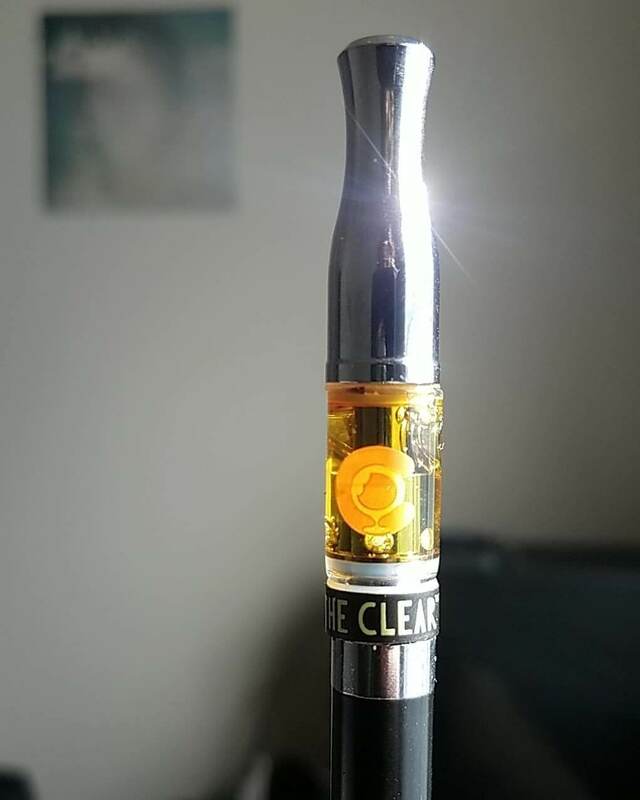 Those who are looking for low dose THC vape cartridges will enjoy The Clear cartridges. The negatives – the high price of these cartridges is perhaps the biggest deterrent of them all. If these cartridges come in at a lower cost it could be well worth it. However, when compared to other brands of pre-filled cartridges, they are among the most expensive ones on the market. There are many other options out there which offer you better value for your money. It’s quite surprising that The Clear cartridge tested below 50% THC. Did you try this brand? Let us know in the comments!